Simply and quickly copy/paste images & rich content into SharePoint! Clipboard Manager for SharePoint enables to easily copy images & rich-text documents from local desktop into SharePoint rich-content fields and web pages. 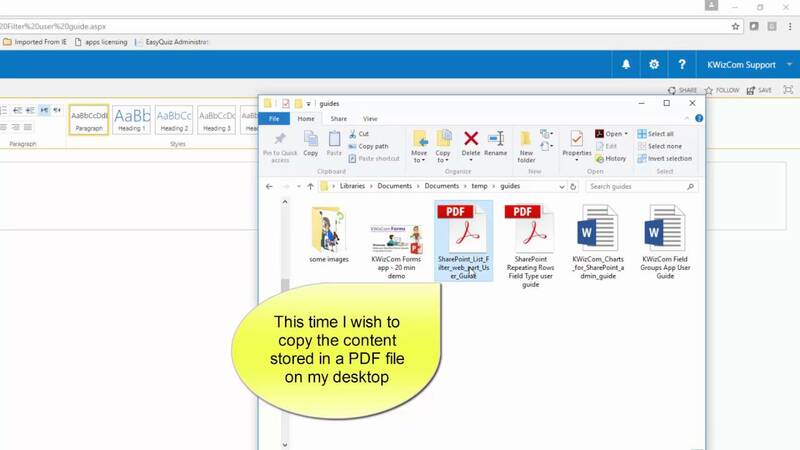 SharePoint content editors & contributors can take images from their MS Windows clipboard as well as any rich-text from a MS Word document and save it in SharePoint, using only copy/paste actions. When migrating a document knowledge-base to a SharePoint Wiki, customers usually struggle with copying material. For example, MS Word documents that include rich-text, tables or images, cannot just be copied to Wiki pages. The copying process is long and cumbersome and requires saving and uploading each embedded item to a SharePoint Library, then copying the plain text and then reformatting the plain text and the uploaded embedded items into a single document again. SharePoint Clipboard Manager eliminates this process completely, enabling customers to simply and quickly copy/paste images and rich content into SharePoint rich-text fields.